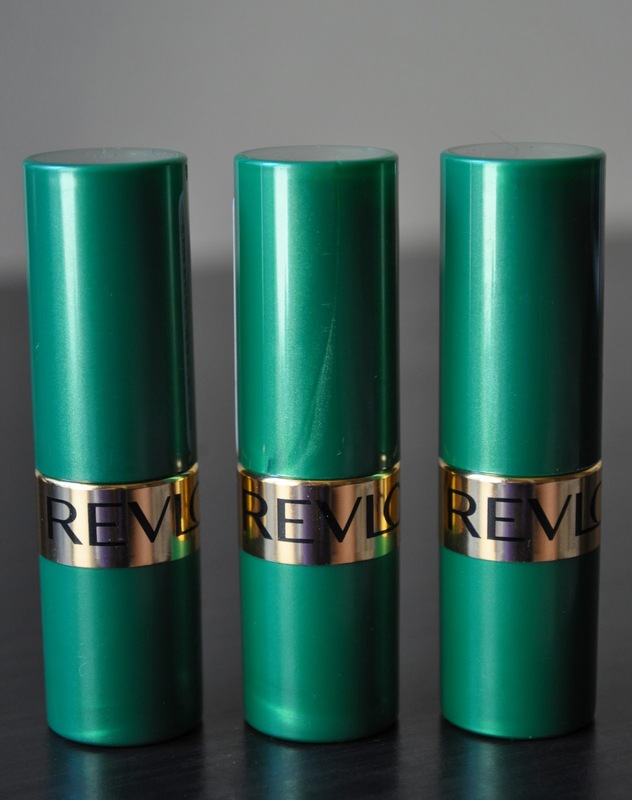 When it comes to drug store lipsticks, Revlon has to be my favorite brand in the states. 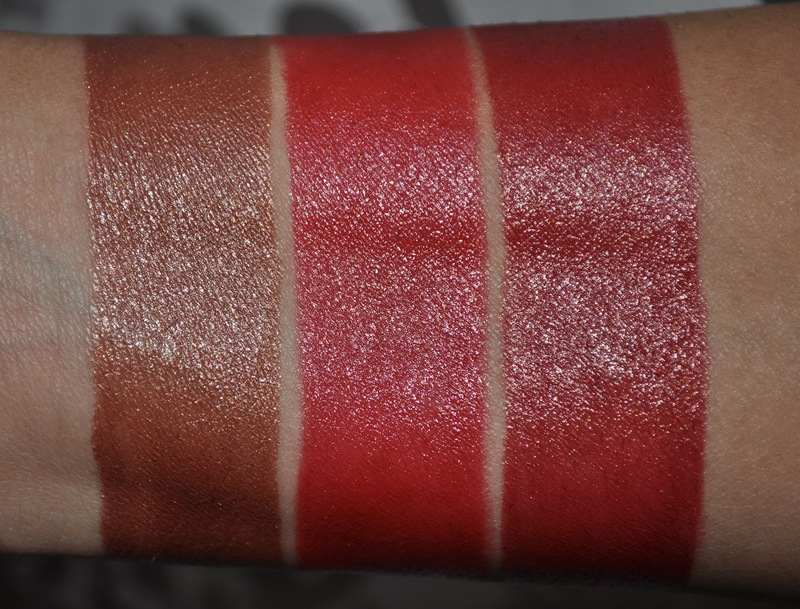 I was going to swatch all my Revlon lipsticks, but decided to divide them into their proper lines. Up first (and the ones I own the least of) are the Moon Drops Lipsticks. The shades I own are: Iced Coffee 360, Copperglaze Sienna 320, and Copperglaze Brown 335. 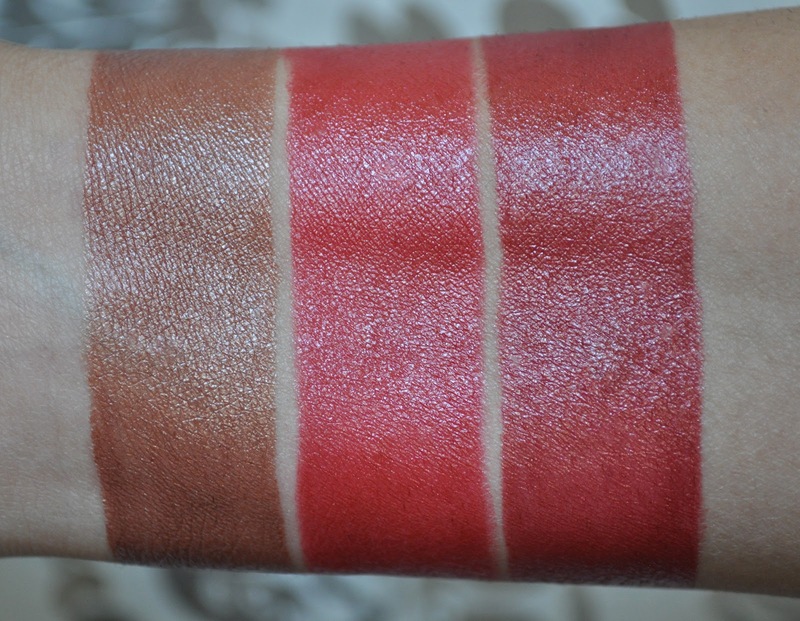 I used to have Blase Apricot, Orange Flip, and 24K Orange, but I finished them about two years ago; if you're into orange lipsticks, I highly recommend them! Revlon Moon Drops lipsticks retail for $8.99. From left to right: Iced Coffee, Copperglaze Sienna, and Copperglaze Brown in natural light. Iced Coffee: a neutral, glossy reddish brown. Copperglaze Sienna: A glossy, bright russet red. Copperglaze Brown: A glossy brick red with a copper sheen. From left to right: Iced Coffee, Copperglaze Sienna, and Copperglaze Brown with flash. These lipsticks are very moisturizing, glossy and extremely comfortable on the lips. They last for about 5 to 6 hours. Moon Drops do have a perfume scent, which doesn't bother me, but it may turn some of you off. Sadly, Iced Coffee, Copperglaze Sienna, and Copperglaze Brown have been discontinued (Why, God?! Why?! ), but I did an online search and they are available on amazon.com and ebay. 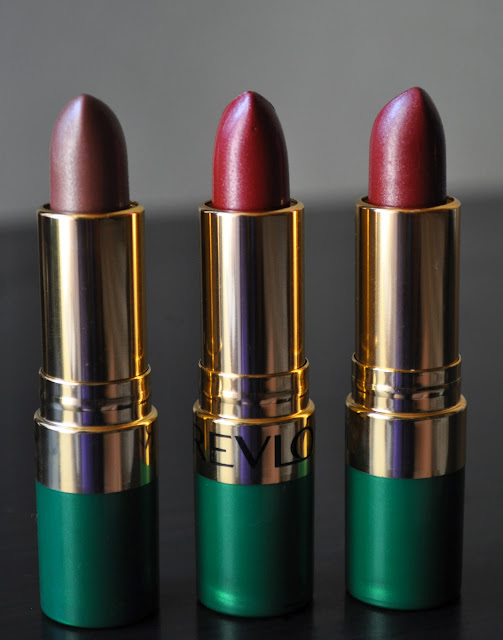 Have you every tried any of the Revlon Moon Drops lipsticks? I just ordered Revlon Copperglaze Brown 335 from Ebay --- thanks to seeing how the colours look on real skin. Can't wait for my order. Love your blog, it's great! Thanks for posting the great pics! Wore Copperglaze Sienna for 25 years. I was so disappointed when it was discontinued, and have been digging out the bottom of the last few tubes I had. This week, I found copperglaze sienna 320 at the local Kroger. Bought 2! Won't be without it for a while. Has Revlon brought this color back? or did Kroger find some in a storehouse somewhere? Should I go back and get the other two tubes? Sorry I'm late. Hell yeah! I hope you went back, and cleared that Kroger out! Copperglaze Sienna is a gorgeous shade. And when I'm out, I'll probably cry...not kidding. After finding it at the local Kroger, I also found it at local CVS store. Bought 2 more. Keeping 2 in fridge . . . hope that is proper storage! Try CVS or Kroger. Good luck! Thank you for the heads up. I'll see if any of my friends in the states can check their local CVS and Krogers.